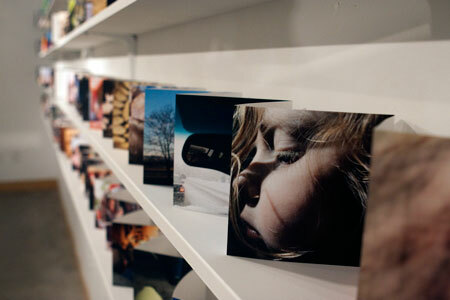 Through March 12th, 23 Sandy Gallery is exhibiting "Photo Book Works," features national and international books, selected by Mia Semingson and first shown in Abecedarian Gallery in Denver, that "incorporate photography as a primary image medium." 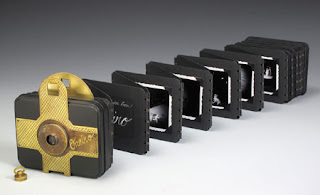 The books range from one-of-a-kind hand-held artist books accented with photographs, to photographs of a large scale outdoor book sculpture ("Book Man" by Stewart Harvey from Burning Man, 2000), to the finely printed and professionally letter-pressed limited edition books of photographs. Although the "Photo Book Works" offers a variety of pieces showcasing contemporary explorations of the book as an art object unto itself, the worth of this show is in several of the more traditional books which provoke thoughtful contemplation of time, aging and mortality. A number of the stronger pieces featured in this show are by female artists self-reflecting on existential feelings of loss, nostalgia, aging and mortality though image and journey (journey on a road, journey within, journey through time, journey through the book). Among these books is a breadth of experience and perspective. Mia Semingson's work, made up of snapshots of her every day life with her family during her 40th year, draws the viewer in with colorful and approachable images, and it is easy to sympathize with her self-reflective project about aging and living. Ginger Burrell's "The Heaven Project" communicates through digitally manipulated black and white photographs different descriptions of heaven. Slowly turning the pages of this book, the viewer is inspired by the unique visions of individuals' utopia while being subtly led to questions of one's own views of mortality and the mystery of what happens in the hereafter. Several other book works also allow us to take a journey along with the artist. Sally Waterman's "The Journey Home" is a "visual diary documenting a repeated journey" of the artist on the train to visit her family outside of London. 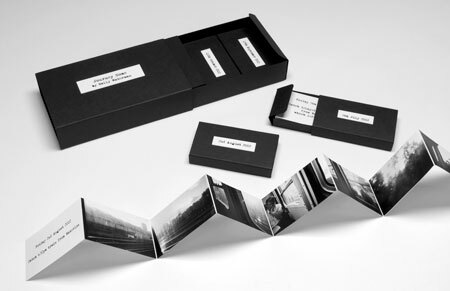 From afar the small black and white images of the many small accordion books look alike, contrasts, lines and perspectives of industrial England inside and outside the train. But upon close examination, each day becomes its own world with keen observation of fellow passengers and the ever-changing passing landscapes. Time is elapsed and extended; change is apparent but still somehow things are the same. Heather F. Wetzel's photo book explores "nostalgia for childhood memories" during a road trip made up of intentional decisions to repeatedly get lost. 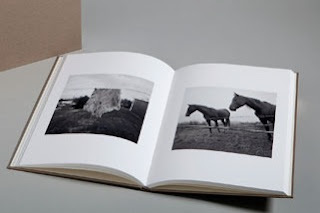 Lauren Hankin's Displaced, her first book, is a careful assemblage of eerie yet romantic richly printed landscape photographs within a beautifully bound and letter-pressed structure (printed by the artist, with letterpress by Inge Bruggeman of Textura Printing and bound by John De Merritt Bookbinding). The images are evocative of the sadness, distortion, transformation, nostalgia and loneliness of the artist as she journeyed by herself into the countryside of Northeastern North America and also into herself as she experienced the loss of a marriage's end. In Part I, the photographs depict a freedom and hope. "My senses were re-awakening. I began to see again- beauty I had been blind to for a long time: clear sparkling rivers, beachfronts dimpled by boulders, shrouded in fog," Hankin comments, and the images are full of a nostalgic bliss, a hopeful commentary. The photographs of Part II carry on a soft and innocent beauty, but also exemplify the artist's transformed emotions and her feeling of suffocating fear. The artist writes, "I believed that the only way I could overcome these fears was by documenting them; by imprisoning what terrified me most onto a small frame of film, and eventually transforming them into beauty." Hankin's photo book expresses the transfiguring and convoluted power that emotions can have on our view of the world, while offering images of timeless and serene beauty. Images from top: Judith Hoffman, Mia Semingson, Sally Waterman, Lauren Henkin. All images copyright the artists. The Oregon Cultural Trust, along with other leading cultural organizations in the state including the Oregon Arts Commission and Oregon Humanities, is offering free grant proposal workshops a and information sessions in the month of March throughout Oregon. Representatives from the various organizations will present the types of grants they offer, as well as the best methods to use in writing a proposal. These presentations will be followed by Q & A time and breakout sessions in which participants discuss projects with one another. Portland's session is on Thursday, March 31st from 11am to 1pm at the Central Library downtown. "Writing Strong Grant Proposals" is free and open to the public, but pre-registration is required. Learn more or sign up. What: Modified Style is an annual Fundraiser Fashion Show featuring garments made by local artists out of fabric scrap material that benefits local nonprofits. Each entrant receives a bag full of scraps and has one month to fabricate a wearable creation. Garments are then worn by artist-provided models and auctioned off to raise funds for a local nonprofit. This year, proceeds will benefit Sisters of the Road, Out to Pasture Farm Sanctuary and Children's Healing Arts Project (CHAP). When: Deadline to sign up is February 15th. Bags of fabric will be available for pick up from February 19th through February 26th at Modern Domestic. An image of finished creation, blurb and model name are due April 1st. A dress rehearsal will be April 27th, and the full Fundraiser Fashion Show is scheduled for May 1st, 2011. Where: This year's Modified Style Fundraiser Fashion Show will be held at Disjecta, in the Kenton neighborhood. Who: Entrants need only have "a creative urge of desire to learn" how to sew.Enter in either the amateur category (no sewing experience necessary) or as a professional (if you have ever sold a garment). Modified Style requests a $25 contribution from amateurs and a $40 contribution from professionals to cover the costs of the event. How: E-mail info(at)modifiedstyle(dot)org to sign up to participate. Portland STOCK hosts public dinners in various locations around Portland on a bi-monthly schedule to raise funds for local artists' projects. The next round of artist proposals, in the category of "culture as a component of sustainability," are due by 5pm on February 4th. This time around, Portland STOCK is hosting a special micro-grant dinner, in conjunction with the Dill Pickle Club, at the Visual Culture Symposium 2011, and the dinner is not open to the public. Rather, the dinner will serve to demonstrate a unique micro-granting process and feature Portland-based artists' projects to the national symposium of arts administrators and educators. Learn how to submit an artist proposal.